All the marches being organized for May Day (International Workers’ Day) in Los Angeles will come together as one for the first time in nearly a decade. The unity is a response, they say, to Donald Trump’s agenda, a program they say leans on fear, racism, homophobia, and hate designed to pit working people against one another. 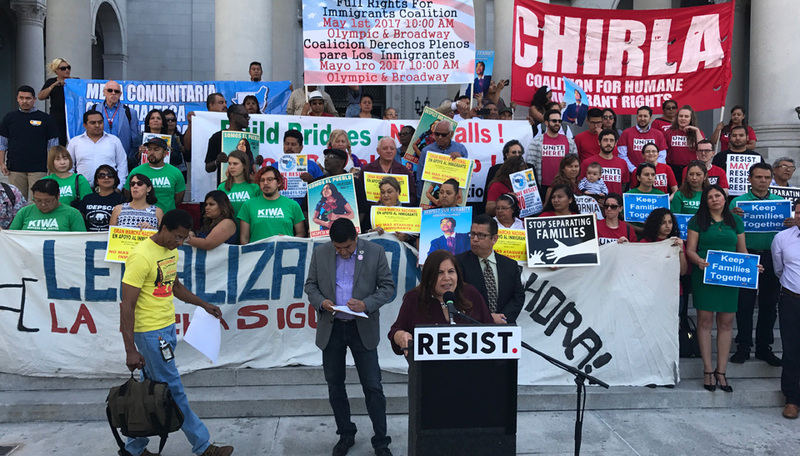 “In light of President Trump’s cruel and racist policies that attack working people, immigrants, public education, Muslims, and the LGBTQ community, we all recognize the time to resist is now… We are sending a message to the administration that we are united,” expressed a statement by the variety of coalitions coming together for May Day in Southern California. The different groups will be leading a variety of marches Los Angeles May 1. 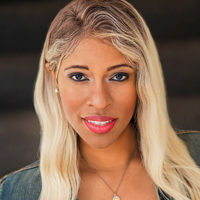 Included is the May Day Coalition of Los Angeles, which is a network of over 100 labor and community organizations throughout Southern California, including the ACLU of Southern California, and Women’s March LA Foundation. The California Latino Congreso, the state affiliate of the National Latino Congreso, a Latino umbrella network of organizations addressing issues affecting the Latino/a/x community, has also called for solidarity among the various marches. Under the banner of “Resist,” the march organizers came together at a press conference on Wednesday to explain why the need for unity among their groups was important now more than ever. “These are unique times and many of our rights and freedoms are on the chopping block by the current administration. The only way to confront the threats we face is to join hands and say ‘enough.’ This May Day we will show our nation what a strong, diverse, and resilient community Los Angeles has become,” said Angelica Salas, executive director of the Coalition for Humane Immigrant Rights (CHIRLA), and representative for the May Day Coalition. “President Donald Trump has failed to fix our broken immigration system. Instead, he’s chosen to fill with fear the hearts and minds of millions of working immigrant men and women who are afraid of the ongoing immigration raids and deportations,” said Juan Jose Gutierrez, national coordinator of the Full Rights for Immigrants Coalition. “On May 1, hundreds of thousands of students and workers will march and rally in downtown Los Angeles to demand immigration reform with a path to citizenship from the U.S. Congress,” Gutierrez proclaimed. “This attack by Trump against immigrants, women, the LGBTQ community, Muslims, and black and brown peoples targeted by ICE and the police is part of a larger attack against all working people… We’re going to show him [Trump] and politicians on either side of the aisle that our solidarity is strong and we won’t tolerate a system that gives only austerity and terror,” said John Parker on behalf of the May Day General Strike Coalition. The various marches are expected to turn out at least 100,000 supporters in the streets to rally on May 1. 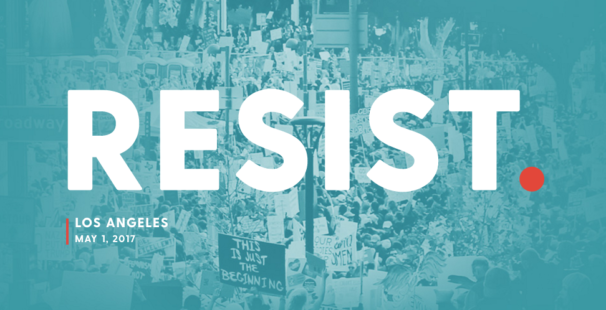 For those looking for ways to get involved this upcoming May Day in Los Angeles, the May Day Coalition’s website http://weresist.la/ lists ways to participate, a route map, and graphics for download. They also encourage supporters to share the Facebook event page, which can be found here: https://www.facebook.com/events/1901568740127007/ .